This house, built in the early 1850s, was the home of Rush R. Sloane (1828-1908), a Sandusky, Ohio, lawyer, abolitionist, and Underground Railroad participant. The son of a local jeweler who arrived in Ohio around 1815, Sloane started studying law at the age of 17 and was admitted to the bar in 1849. 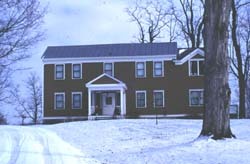 Purchasing this house in 1854 from its first owner and builder, Samuel Torrey, Sloane practiced law in Sandusky and became involved in local abolitionist activities. His antislavery sentiments were most probably cultivated while studying law with lawyer F.D. Parish, a leading Sandusky abolitionist whose home was a known Underground Railroad station. One of Sloane's more well-known antislavery protests occured in 1852 when seven runaway slaves arrived in Sandusky on the Mad River & Lake Erie Railroad. The slaves were later captured aboard a steamer by three men from Kentucky claiming to be their owners. On behalf of the fugitive slaves, Sloane petitioned the mayor to investigate the evidence and questioned if the runaways were properly arrested and legally detained. Finding no legal authority for the arrest, local officials ordered that the slaves be released immediately. Shortly afterwards, one of the Kentucky men displayed legal papers of ownership and filed charges against Sloane under the Fugitive Slave Act. He was tried in the U.S. District Court in Columbus and fined $3,000 plus $1,330.30 in court and attorney fees. The local African American community, in appreciation of Sloane's efforts, presented him with a silver-headed cane that today is on display at the Follett House Museum at 404 Wayne Street in Sandusky. Three years after his trial, Sloane became a probate judge in Erie County and in 1861 was appointed as an agent to the U.S. Post Office in Chicago. While in Chicago, Sloane made a fortune in real estate. He became president of the Sandusky, Dayton, and Cincinnati Railroad in 1867 and was elected mayor of Sandusky in 1879. An influential and successful member of the Sandusky community, Rush Sloane sacrificed his money and reputation by participating in the Underground Railroad. 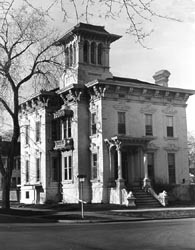 The Rush R. Sloane House is located at 403 East Adams Street in Sandusky, Ohio. Currently vacant, the house is not open to the public. For more information on the Underground Railroad in Sandusky, visit the Lake Erie Shores and Islands for more information.